When I think of New York, bagels, pizza and coffee immediately spring to mind. Just me? It would take a lifetime to try all of the incredible food that this city has to offer but I managed to drop by some of the most highly recommended spots and also discovered a few hidden treasures along the way. You can't leave NYC without having a bagel for breakfast at least once, am I right? 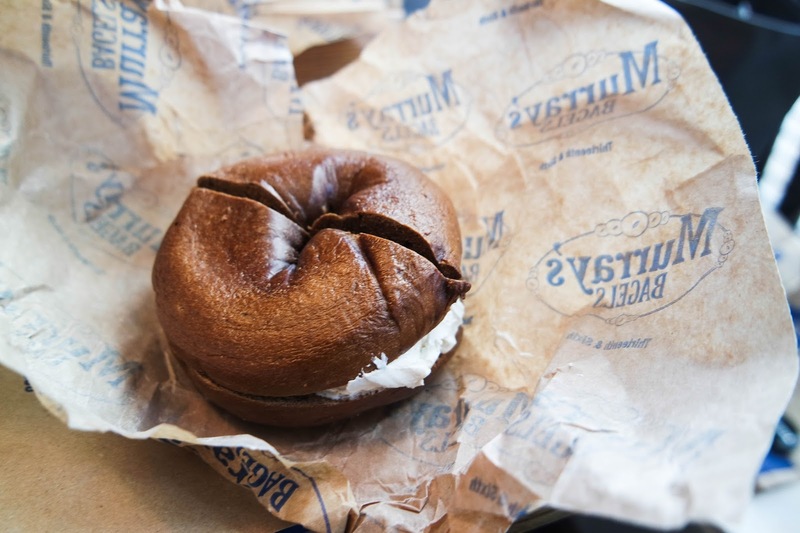 Murray's Bagels is a short walk from Union Square and it's the perfect spot to pick up a classic New York Bagel. Not only do they have a pretty impressive selection on offer, but the bagels are also hand-rolled and made fresh everyday so you can be sure that you are getting great quality too. 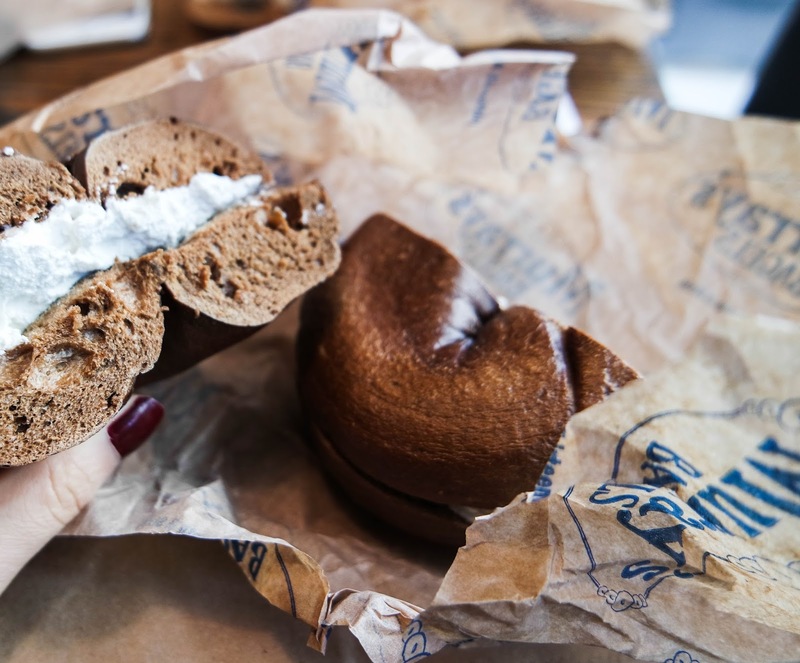 I opted for the pumpernickel bagel with a tofu cream spread and it really hit the spot (current bagel cravings are running high - writing this blog post late at night was prooobably not the best idea) . If you choose to eat in, be sure to grab the cosy window seats and watch New York go by as you munch away. For a great slice of pizza I would highly recommend Two Boots Pizzeria - a great choice for veggies and non-veggies alike. Their vegan slice has a thin, crispy base with the freshest toppings and the best ooey gooey 'cheese' mmmm. Please come to the UK Two Boots? If you happen to be wondering around Times Square, avoid the disappointment of tourist food in the area and head straight to the Hell's Kitchen branch for a true taste of New York. Le Pain Quotidien is a fail safe option for super nutritious and delicious food. Although not typically American, Le Pain has branches conveniently dotted all around the city and it's the best spot to refuel after a day of exploring. 'The Baker's Lunch' was my personal favourite - a scrumptious trio of quinoa salad, avocado toast and seasonal soup. It was so good in fact, that I ate this twice during my stay and it definitely stands out as one of my favourite meals of the trip. If you are looking for a good brunch, The Butcher's Daughter is a vegetarian cafe with a highly instagrammable and healthy menu featuring buckwheat pancakes, acai bowls, smoothies and 'wellness lattes' (a health-foodies dream!). Unfortunately we stopped by one of the smaller branches in West Village just after the breakfast slot ended, so pancakes were not on the menu for me (sigh). The butternut squash soup was delicious but I'll definitely be returning for brunch here someday. We stumbled upon LuAnne's Wild Ginger one evening whilst walking through Little Italy and it was such a great find. If you enjoy Asian food, this restaurant puts a vegan spin on your favourites including pad thai, curries and noodle soups. I would recommend the 'House Bibimbap', a Korean style rice bowl with avocado, chickpeas, seitan and all sorts of veggies that you can enjoy with homemade peanut or chilli sauce. This was my first time trying seitan and it was surprisingly good - meat eaters won't be missing out at this little gem. Now on to the good stuff, coffee. I'll admit I'm no coffee expert but La Colombe serves up a pretty delicious cup of coffee. With warm interiors and the hustle and bustle of locals rushing in and out for their daily fix, there is no mistaking that you are in the heart of New York at their Wall Street branch. Pick up a vegan hemp seed scone to go with your coffee for the ultimate morning treat. For a more relaxed atmosphere pop in to Joe Coffee, the sweet baked goods and turquoise blue cups will certainly perk you up. There are a few locations around Central Park so it's a great option if you want to grab a coffee before taking a stroll around the park. And finally Bluestone Lane Coffee. This Australian inspired cafe has a wonderful food and drinks menu but if you fancy something a little different, try the Golden Latte. It's essentially a warm and frothy turmeric almond milk and it's the perfect superfood beverage to warm up on a crisp Autumn afternoon. Where are your favourite places to eat in New York? Anything I should add to my list?